you could totally do my job with those ms paint/photoshop skillz!!! haha yess. 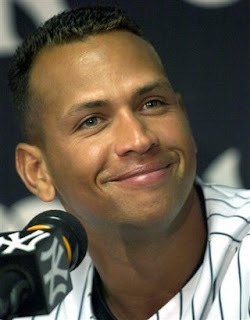 and let me just state that this whole A-rod thing is ridiculous. Bonds who didn't cater to the press (and who i know most people don't like but i stand by my man!) got thrown to the wolves while A-rod the golden child is just going to get a slap on the wrist. i'm for ya bonds. haha first of all, hilarious post. second of all, "roids" is a weird half-word. third of all, if anyone didn't watch the president's speech on monday, in addition to being asked about the stimulus plan, talks with Iran, and the future of our country, one reporter felt it was important to get the president's take on A-rod. ridiculously unnecessary. ok. so he won't admit it. but putting him on trial and maybe sending him to jail? come on. let's be serious. talk about a scapegoat. He's not going to be going to jail for taking steroids. If he does go to jail, it would be because he lied under oath. Same thing happened to Miguel Tejada who just pled guilty to lying yesterday. So there's another scapegoat for you.